Ring is size 6-1/2, it measures approximately 7/8" long and 1-1/8" wide. There is nothing at all average about this beautiful ring! The ring is a marvelous piece of jewelry that is hand crafted out of genuine sterling silver and Multicolor inlay. The inlay consists of: real Tiger Eye, Turquoise, Picture Rock, and Black Jade. 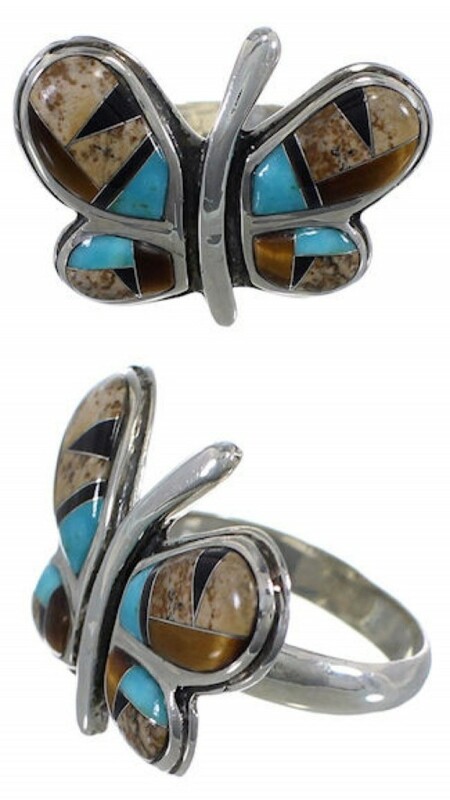 The inlay is carefully set, while forming a stunning butterfly design. Thin silver lines can be seen accenting in between the inlay adding a stylish look. The ring is stamped sterling and hallmarked.